There are many different kinds of cardiovascular disease, which affect over 17 million people worldwide1. The global cardiovascular disease (CVD) pharmaceutical market alone is forecast to grow to some US$ 107 billion by 20182 , while the US$ 200 billion3 medical device market (diagnostic, therapeutic and monitoring) is led by CVD sales. Of the new therapeutic pharmaceuticals being developed, the highest proportion is for CVD4. Within this global market, companies and re searchers in the BioAlps cluster have contributed signifi cantly to the market.The first stents and the worldwide first balloon dilatation of a coronary artery to treat coronary artery disease were invented and developed in our region. The innovations in technology and design of cardiovascular devices such as artificial hearts, bioresorbable stents, tissue heart valves and heart rhythm devices with wireless telemetry features are driving the cardiovascular de vices market. Surgery has become less and less invasive, driven by such centres of excellence as the Geneva University Hospitals (HUG) and the Bern University Hospital (Inselspital). As the burden of CVD grows with ageing populations and more sedentary lifestyles, research continues apace. AtheroRemo5 , a 7th Framework Collaborative Project based in Geneva, is carrying out basic and clinical research focused on inflammatory processes of and immunity in atherosclerotic cardiovascular diseases. Uniquely poised to draw on the multidisciplinary expertise in the region, ARTORG Cardiovascular Engineering (ACE)6 is a joint research organisation in which expertise in biomedical engineering research, clinical research and clinical medicine converge to find new ways to diagnose and treat CVD. ACE is part of the newly founded Artificial Organ (ARTORG) Center for Biomedical Engineering Research at the University of Bern. The Depart ments of Cardiovascular Surgery and Cardiology (Inselspital, University Hospital Bern) and the Medical Faculty of the University of Bern are the clinical partners of ACE. Two of the major multinational players in the CVD field chose the region to house their European headquarters, Medtronic and Edwards Lifesciences. Several dynamic start-ups have profited from the interdisciplinarity available in the region, notably Endosense, which has developed the first force-sensing catheter for atrial fibrillation ablation. Symetis is a privately held Swiss company developing new transcatheter aortic valve implantation (TAVI) solutions for all access: transapical, transfemoral and transaortic. TAVI is recommended for high-risk patients with severe aortic stenosis and not eligible for conventional open-heart surgery. Led by serial entrepreneur Jacques Essinger, Symetis is targeting the ca. $2 billion TAVI market. 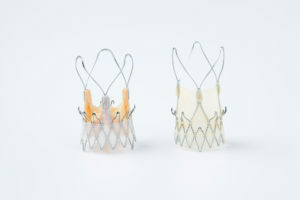 The company’s products, ACURATE TA™ and ACURATE TF™, are composed of a porcine biologic valve attached to a self-expandable nitinol stent which features a unique self-seating, self-sealing design, realising straightforward implant procedures, better results and fewer TAVI complications. In post market studies, ACURATE TA™ has demonstrated a high procedure success rate, superior safety profile and minimal PV leak. Symetis’ ACURATE TA™ Transapical Aortic Bioprosthesis has been granted CE Mark in 2011 and the ACURATE TF™ transfemoral device, is currently in CE Mark trial phase and is expected to receive approval by the end of 2013. As cardiovascular disease is often linked to other pathologies, cardiology benefits from cutting edge research in related diseases, as well as from the array of micro- and nanotechnologies in the BioAlps region. The combined strength of the region’s research institutions, teaching and research hospitals, and technology centres, provide an environment conducive to research and development, resulting in world premières such as stents.